The Japan Times has been delivering the news of the nation for more than 120 years. No one knows Japan better. A subscription puts you in the know, with the latest English-language news and insights about Japan and the world, available on a variety of devices. Read a trusted authority on the nation’s past, present and future. Our history spans more than 120 years, and it is generations of readers’ support that fuels our reputation as a go-to source of information. Read the news source widely respected for its authoritative coverage of the news, making it the English-language newspaper with largest circulation in Japan. Hear an independent voice, made up of experienced reporters, editors and contributors, providing both the local angle and a global perspective. Join a community of readers who want to not only follow the news of the day but also better understand their neighbors and the world around them. Get the same high-quality made for print — and more — on the digital device of your choice. As a member, you can receive the top stories of the day in your inbox. Get your daily dose of Japan news without searching. Whether you want to browse news on your desktop, smartphone or tablet, we've got your covered. The Japan Times Website renders to virtually screen size. Not a heavy user? No problem. The Digital plan gives full access to all content while our Digital Lite plan allows subscribers to read up to 80 stories a month. Choose the plan that suits your needs — and upgrade whenever you like. Step 1: Register for The Japan Times Membership Services (if you are currently receiving Email Updates, you are already registered. You can skip this step). Step 2: Log in to your My Account page to set up your full digital subscription. You are already registered for The Japan Times Membership Services. Set up your full digital subscription after logging in to your My Account page . 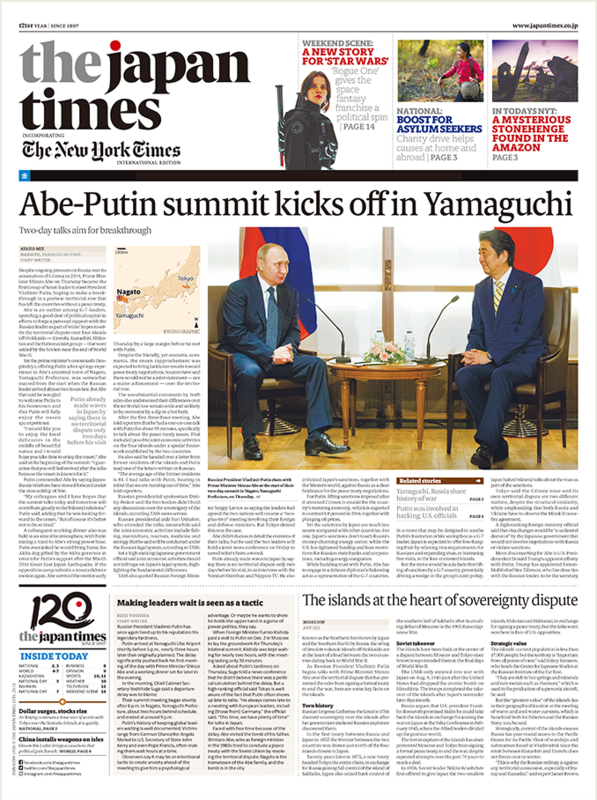 Print subscribers get the daily home delivery of both the print edition of The Japan Times and that of the internationally renowned The New York Times, plus the weekly delivery of the award-winning Japan Times on Sunday. 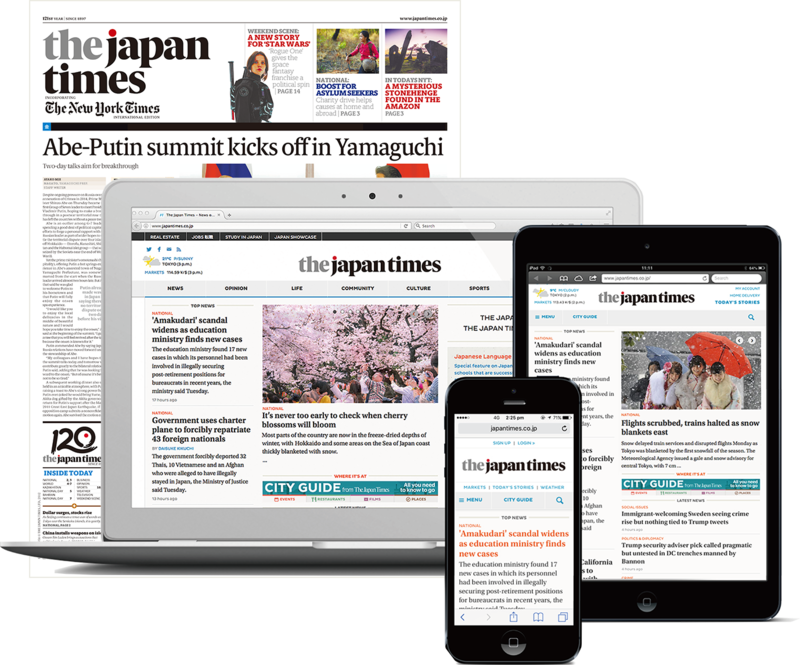 Bundled with the print subscription is free, full access to The Japan Times Website and the digital content of NYTimes.com (separate registration required). ∗ Home delivery is only available in Japan. The Digital Lite plan costs ¥900 ($9) per month and allows access to 80 stories a month, including 10 Kyodo News archived stories (older than one month). Digital Lite users who run out of stories have the option of purchasing booster packs in increments of 40 or 80 stories, or upgrading to the full Digital plan. Only new subscriptions are free for the applied month. Charges start from the next month. *Free subscription for the applied month is limited to one plan per person. A free membership is required to access 10 stories. *Those who are not registered can only read up to five stories per month. Kyodo News stories expire after 30 days. For the details of wire service contracts, see here . Subscribing to the DIGITAL plan (with charge) allows unlimited access to all stories. No, the front page, category index pages (e.g. Top News page ) and search result pages are not included in the story allotment. Can I read all the stories in the newspaper on The Japan Times Website? The vast majority of stories published in the paper will also appear online. A small number, however, are published in print only. Due to wire service contracts, certain stories will be displayed online for a limited time. I'm a JT/NYT subscriber. How can I use my subscriber benefits to utilize the free full access to The Japan Times website and NYTimes.com? Follow these simple steps to start enjoying free digital access on any device. Choose "About JT/NYT print subscription benefit"
Click on "Sign up for membership" and follow the steps. When complete, proceed from step 2 above. There is a free app available. *May not work on certain device versions. 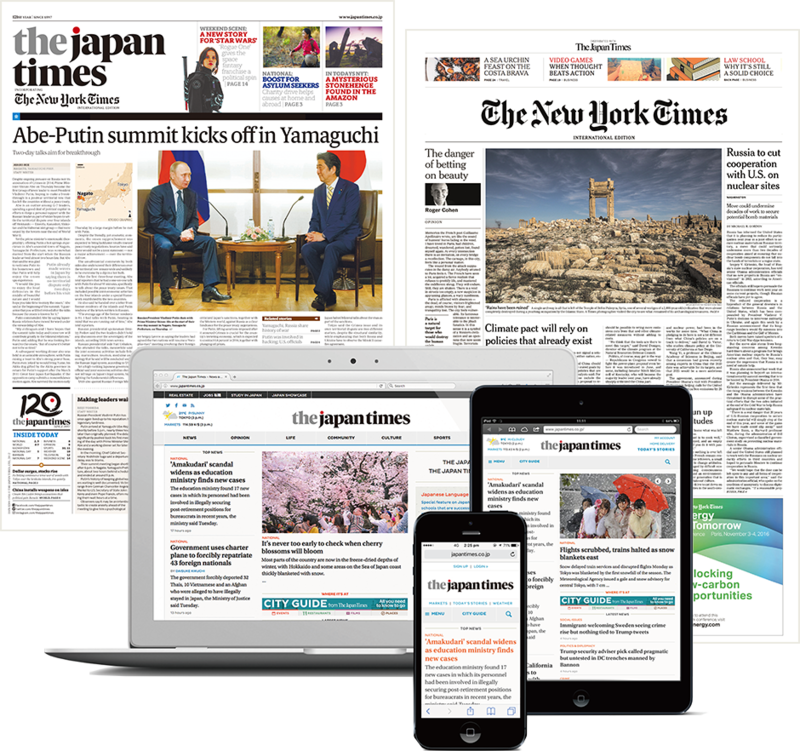 ■ Those subscribing to the print edition of The Japan Times / The New York Times can enjoy for free and unlimited access to the digital content of both publications. *If you haven't registered for The Japan Times Membership Service (free), please proceed here . *If you have registered, please log in and enjoy. ■ Digital plan subscribers can enjoy free, unlimited stories. ■ Digital Lite subscribers can read 80 stories per month. 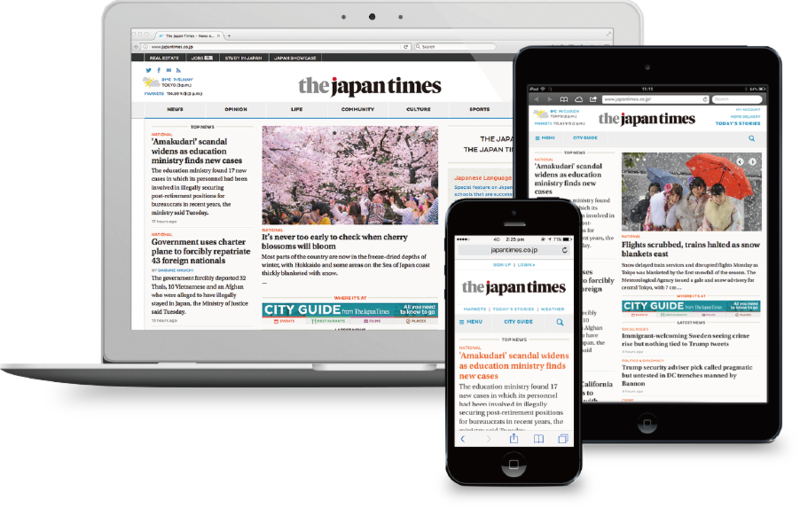 ■ Registrants of The Japan Times Membership Service can read 10 stories per month. Non-registrants can read five stories per month. Please make sure to log in! *If you haven't used the service for a while, powered off or restarted device, you may need to log in again. Can I view the website on any browser? *The website may not be viewed due to the settings and environments of your device, even when using the latest version of the browser. Browse Happy is an option that alerts you whether your browser is fully updated. Browse Happy provides update information of major browsers. It also helps you find other browsers that may better suit your needs.